Hundreds Of Whales Die Stranded On A Remote New Zealand Beach : The Two-Way The country's Department of Conservation says the stranding of more than 400 whales is one of its worst on record. Rescue attempts are underway for the survivors, which number upwards of 100. Volunteers try to save about 100 pilot whales after more than 400 of them were stranded at Farewell Spit near Nelson, New Zealand, on Friday. 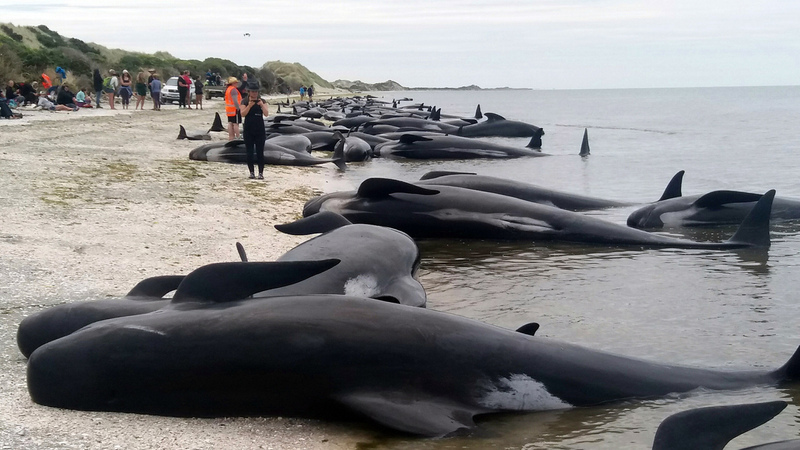 By the time Ceree Morrison found hundreds of pilot whales washed ashore on a remote beach in New Zealand 250 to 300 of them were already dead. The rest remained alive on Farewell Spit, a long strip of land that hooks from the country's South Island into the sea. "You could hear the sounds of splashing, of blowholes being cleared, of sighing," Morrison told The Associated Press. "The young ones were the worst. Crying is the only way to describe it." All told, about 416 pilot whales had stranded at Farewell Spit before they were found Thursday night, the New Zealand Department of Conservation said in a statement. Even in a country with one of the highest stranding rates in the world — about 300 dolphins and whales a year beach themselves, according to marine conservation group Project Jonah — the DOC says this is the third largest single stranding ever recorded in New Zealand. Farewell Spit, in particular, is "sometimes described as a whale trap," the AP notes. "The spit's long coastline and gently sloping beaches seem to make it difficult for whales to navigate away from once they get close." As the tide rolled in Friday, hundreds of volunteers in the region attempted to send the surviving whales back to sea, pushing them out as the water rose high enough to do so and forming a human chain to try to block them from returning to the beach. Of the survivors, about 50 successfully swam back into the bay, while about 80 to 90 were restranded, the DOC says. No single cause for strandings is known, Project Jonah says, though the group explains that some factors are thought to include navigational errors, injuries from sonar blasts or fishing nets, and strong social bonds that can draw whole pods to follow wayward individuals into danger. The AP reports that volunteers were able to refloat about 100 whales on Saturday. The wire service notes that some whales that were refloated on Friday beached themselves again, but the Saturday morning tide may keep the latest group at sea.